Nowadays, a company’s attitude toward “green living” significantly impacts the way we perceive that company. It also impacts the way we perceive their products and services. Brands like Seventh Generation and Burt’s Bees are perfect testaments to this. Going green can positively impact your business’ performance and profits, but how? And what are some steps you can take? The government rewards manufacturers that attempt to implement more eco-friendly production methods. Tax breaks and incentives are frequently offered to companies (and individuals) looking to make the world a greener place. In fact, carpool tax deductions are even available for commuting individuals. For real estate and property development companies, green buildings are often eligible for premium insurance credits. The Environmental Protection Agency’s 2020 Action Agenda is one of the primary instigators of these incentives. There are a few simple steps that can be taken to decrease your business’ overhead and, in turn, boost profits. The shift to a paperless office is one of the easiest and most sensible steps a business can take. With modern technology, it’s such an effortless move, there’s almost no reason not to. Not only does this have a positive effect on the amount of carbon used to produce and ship paper products, but it also decreases company’s spending on paper products, printer ink, elaborate filing systems, etc. Allowing employees to work remotely has a similar effect, particularly on your utility costs and energy usage. Labor laws require commercial office buildings to be kept cool and have certain resources, which further increase environmental impact. When we hear about eco-friendly pursuits, we always feel a little inspired, motivated, and overall enlightened. Now, imagine how implementing eco-friendly initiatives will impact your employees’ attitudes. Employees associate higher moral and ethical values with companies that are forward-thinking and environmentally conscious. Making company activities out of these eco-friendly initiatives will also improve morale. As a result, your company could see lower turnover rates and heightened employee loyalty. Be willing to reward employees for their eco-friendly moves, as well. Consider Bank of America’s decision to offer grants for employees investing in solar panels. While your rewards don’t have to be this elaborate, you can certainly make it part of the company culture. And, with high turnover costing companies thousands of dollars each year, you can forego this expense. Everyone loves the eco-friendly narrative. It’s heart-warming, powerful, and inviting. Your business can use its “green” initiatives as part of a PR campaign. 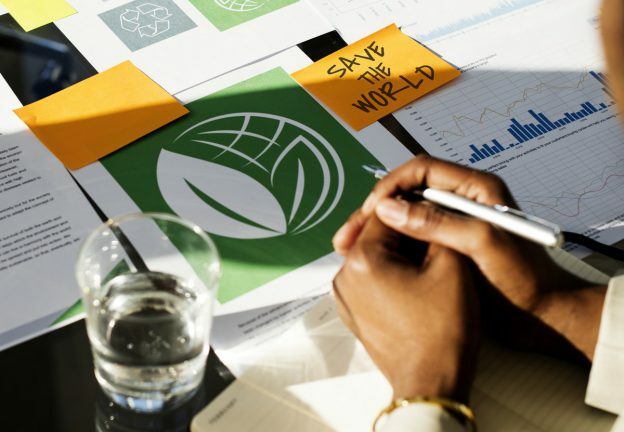 Advertising your company or brand as an environmentally conscious entity will definitely gain eyeballs, and makes for some highly effective advertising. Consumers associate socially responsible brands with trustworthiness, and millennials especially value brands with an elevated moral standing. So much so, that 77% would pay more for products from sustainable sources and socially responsible businesses. By using your company’s green initiatives as a selling point, you’ll be sure to expand your customer base – and your revenue.